Vectors, colours and complex numbers. The model VWR. Examples in the Blender. Today, I want to tell a little, about my solution to an interesting problem. But I want to do this, using the colour model with white and two other colours. Continue reading Vectors, colours and complex numbers. The model VWR. Examples in the Blender. 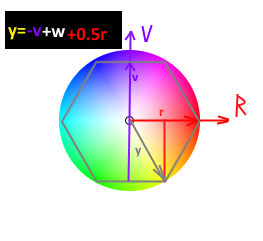 Posted on 18.01.2019 18.03.2019 Tags 3D modelling, Blender, color models, complex numbers, graphics, linear algebra, mathsLeave a comment on Vectors, colours and complex numbers. The model VWR. Examples in the Blender.